Hi, I need to order a replacement photoconductor for the Epson CX21NF printer. Is there something you can provide or recommend? Thanks, Becky. The Epson AcuLaser CX21NF is a multifunction printer that will have no problem fitting into a small business or a home office setting. This colour laser printer has the ability to fax, copy, print, and scan using one device. It will produce rapid prints in speeds that can reach up to 25 pages per minute. Copying is accomplished at a resolution of 600 x 600 dpi and 99 copies can be made at one time. The scanner uses a 24-bit colour depth map and can scan in an optical resolution of 600 x 600 dpi. 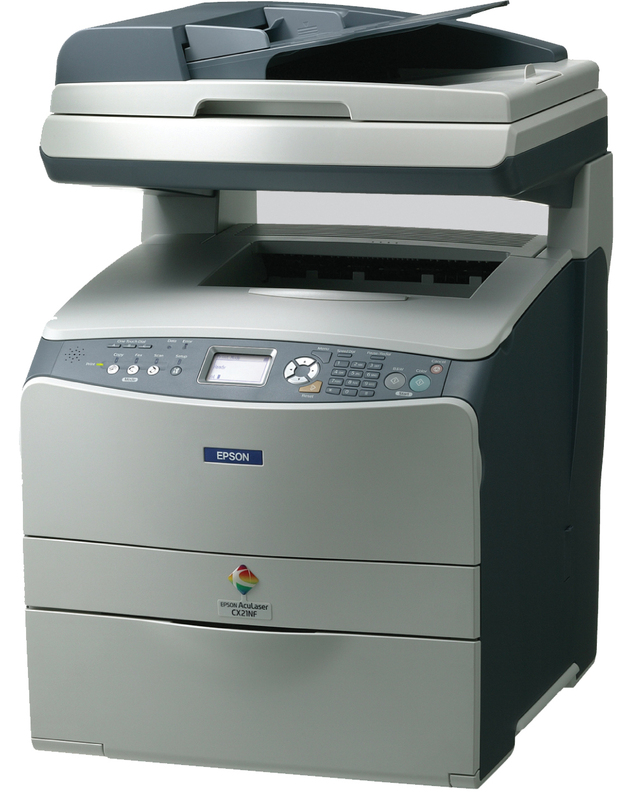 The fax machine is Super 3G compliant and has a memory capacity of 200 pages. Designed to occupy as little space as possible, it has dimensions of 45.97 cm in width, 46.73 cm in depth, and 66.80 cm in height. The Epson CX21NF toner printer can also be rather heavy to lift at a weight of 33.11 kg without paper. This printer is manufactured to use 790 watts of energy during operation and only 18 watts in sleep mode. Epson CX21NF toner can also yield up to 5,000 pages before needing to be replaced. This printer also features a 180 sheet input tray that comes with a 250 sheet output bin. This printer can produce a black and white print in only 9.0 seconds and for colour, the Epson AcuLaser CX21NF can produce a printout in 17 seconds. Connection to a computer is simple and can be achieved using a USB port or an Ethernet cable. This printer also uses Colour 2400 RIT to enhance images and produce colours as close as possible. In addition, the CX21NF can also be adapted to print without wires using a Epson Net 802.11b/g adapter card. Noise is an issue. This printer is also very loud and will create up to 57 db during operation. In addition, the Epson AcuLaser CX21NF has an incredibly high price, which is above the average home user's range. For some users, copies come out darker than expected. However, this problem is easily corrected using the darkness settings to personalise your prints.